The bridge of the Enterprise-D was slightly smaller than I thought it would be. 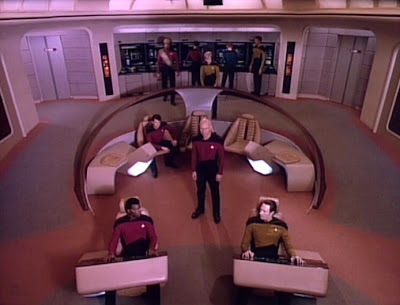 I always got the impression of a slightly grander scale when watching Star Trek: The Next Generation; unlike Kirk's bridge, Picard's bridge feels almost more like a stage than a command center sometimes, with a fair amount of "wasted space" that is of no apparent benefit to the crew, but it provides a bit of a dramatic feel to the bridge, and it also allows plenty of room for alien invaders to romp around. 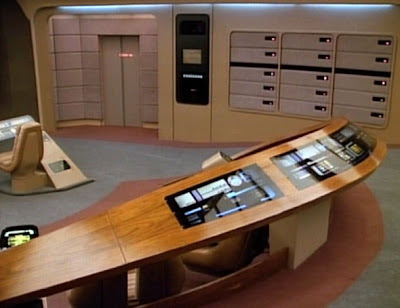 In person, the bridge felt neither like a stage nor the set of a television show; the bridge of the Enterprise-D was the bridge of the Enterprise-D. There was no wasted space for dramatic effect; rather, there was just enough room for a person to move about comfortably, and the size of the bridge struck the perfect balance between that feeling of grandeur I felt when watching the show and a feeling of intimacy, that no crew member was ever so far away from another as to feel isolated, even when standing on opposite sides of the bridge. I thought for sure I'd have to wait in line, be given only a minute or two to wander, and then have a professional snap my picture in the captain's chair before sending me out so the next person or group of people could have a turn. Imagine my surprise when I discovered we were free to come and go as we pleased, and that people were taking turns sitting in the captain's chair without anyone telling them to do so. Obviously, I had stepped into the 24th century; 21st-century people are seldom so considerate. It didn't matter that I was sharing the bridge with complete strangers; I went for a stroll, and the other people there slowly faded away until it was just me and the Enterprise. Incredibly, the captain's chair was vacant. It called to me. But I did not answer the call... not immediately, that is. I wanted to take a few minutes to absorb everything before settling into the Big Chair. I had waited almost my entire life for a chance to be on the bridge of the Enterprise; I was going to savor this. I walked to the large wooden arch at the back of the bridge, and I ran my hand along it as I slowly made my way to Worf's tactical station. I placed my hands on the control panels. I stared out the viewscreen as we flew through the stars. I spent time with each and every one of the aft computer stations, becoming completely immersed in the experience as I listened to the low rumble of the ship, and the chirping and pinging of the computers. I held my hand against the wall as I descended the side ramp, noting the unexpectedly fuzzy feel. I sat at the operations console and reenacted Data's song from Generations about scanning for those tiny little lifeforms. I approached Riker's chair next, to understand the feeling of being almost in command, to better appreciate the Big Chair when I finally took my place there. 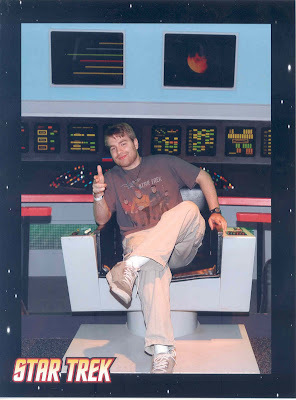 I had dreamed of sitting in the captain's chair on the bridge of the Enterprise for almost as long as I could remember. It was an unlikely dream to accomplish to begin with, but when the television show went off the air, it became even more unlikely, and when Star Trek: Enterprise was cancelled with no new Star Trek to take its place, my dream had all but died. Yet, there I was, sitting in the captain's chair on the bridge of the Enterprise. Do you know what it feels like to fulfill an impossible dream? As I sank into the chair, I felt an overwhelming sense of completion. All was right with the universe. Star Trek had become a part of me over the years, and at long last, I was a part of Star Trek. 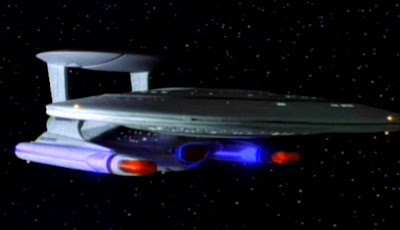 Short of licking the control panels, I had connected with the Enterprise bridge through all my senses, and because of that, the show that had long been a strong influence on my life had become more real than reality. Now I can tell you firsthand that the most powerful place to be is where Worf stands; you can survey the entire bridge from the tactical station, and the feeling of holding on to that wooden railing reminded me of the exhilaration of delivering a speech while gripping the lecturn in front of me (I'm one of those weird people who enjoys public speaking). I can describe the feeling of autonomy that comes from sitting at one of the consoles close to the viewscreen; ain't nobody looking over your shoulder there. I can explain how the captain's chair is truly the focal point of the bridge, that all other stations feel as though they are linked there somehow, feeding their support to the captain or drawing their orders from the Big Chair itself. 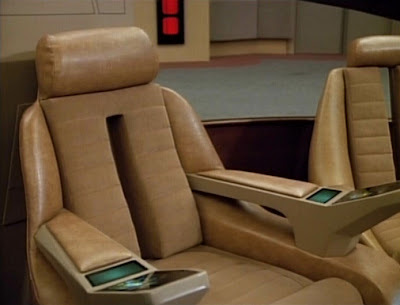 I can also point out that the forward computer consoles obstruct the captain's view of the bottom corners of the viewscreen, and that armrests make a huge difference in being able to sit in those command chairs for extended periods of time. It's amazing we didn't see Riker and Troi sliding out of their seats more often. Ah, but the captain's chair was one of the most perfect chairs I've ever sat in. Of course, I realize this was all about make-believe, and that I was getting all excited about a chair. Heck, this wasn't even the real set, but a replica; the chairs and consoles didn't swivel like they should have; the computer screens weren't interactive at all; there were no automatic turbolift doors; and small children were buzzing about, pounding on control panels and making explosion noises as they fired their pretend photon torpedoes. But you know what? I would have played along in a heartbeat. If you can believe it, I held off on sitting in the captain's chair until everyone else I was traveling with had joined me on the bridge; this was something wondrous to me, and I wanted to share that wonder with others. In time, we went on to see the rest of the exhibit, but I took my time saying goodbye to the bridge of the Enterprise. 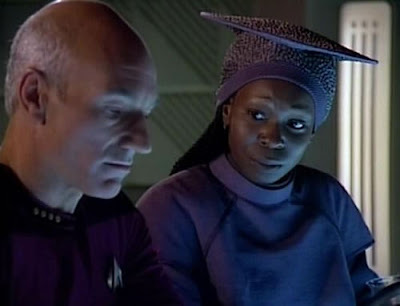 The next few areas continued the Next Generation theme, showcasing one of Guinan's many bartender outfits and the uniform Picard wore in later seasons (which, bafflingly, featured rank pips that were not only incorrect but of a rank that I'm pretty sure doesn't exist--three solid pips and one black "hollow pip," which would be, like, the rank of "Commander-and-a-Half," or, "Captain Junior"). Following these were two more set replicas from Next Generation, including a portion of sickbay with display cases filled with props such as a phaser, a tricorder, a datapad, and a few other items. It's interesting to see some of the earlier props up close, because they often look rather shoddy, with uneven paint jobs and slightly crooked decals and the like. As I understand it, they only spend the big bucks on refining the "hero props," which are the props used in close-up shots, so some of those props most likely were used by extras or characters standing farther away from the camera. Sadly, it was at this point that I noticed that not all props on display were authentic. I would estimate that about half of the objects on display were replicas; it was still a treat to see all that Star Trek stuff in person, though, if for no other reason than that I'd never be able to afford to buy all of those replicas for myself and still expect to... um... eat. Ever. Also in this area was a replica of part of main engineering on the Enterprise-D, which was highly exciting because the warp core is about my single favorite Star Trek thing that isn't a ship. I was almost appalled to see that, in lieu of a warp core model, they had a sort of wall tapestry with a picture of the warp core hanging there. Tsk tsk. At least I got a laugh out of it: If you look very closely at the buttons on the computer panels, many of them have silly labels. I can't remember any specifics off the top of my head, but you might expect buttons labeled with random acronyms to occasionally have things such as, but not necessarily, "HON KONG" and "BA TMAN" printed on them. Three cheers for inside jokes. 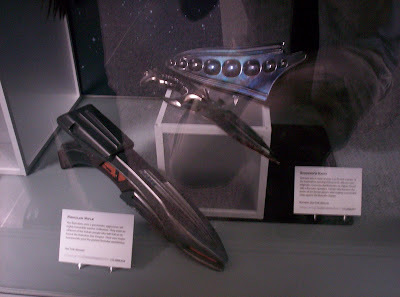 The next section of the exhibit consisted of loads of stuff from Star Trek: Nemesis. I reasoned that there was so much on display from that film because it was one of the most recent Star Treks made, but someone else pointed out that, more likely, nobody wanted to buy anything from Nemesis. 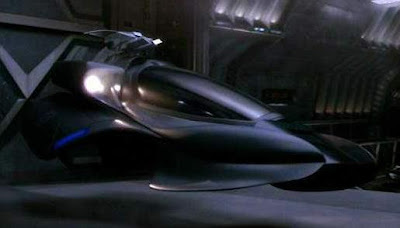 Well, anyhow, they had one model in particular that I found to be very exciting--(minor spoiler)--the attack shuttle that Picard and Data used to escape the Romulan ship by flying down through the hallways. Full size! Big size! And I identified it all on my own, because I know way too much about Star Trek. Also of note was Data's uniform from the TV show; when I finally pried my Data-crazy girlfriend away from the case, she just pointed to it and said with a happily dazed look on her face, "Brent Spiner touched it!" See? I'm not the only one who's a hopeless Star Trek nut. Nearby was Brent Spiner's head in a glass jar. Hang on; let me clarify that. They had on display the android body parts the crew discovers in Nemesis, and it's amazing how lifelike they are, even under close scrutiny. Again, the attention to detail really helps to set Star Trek apart from so many other shows and movies. At this point the exit was in sight, but there was still a lot left to see: mannequin heads clad in makeup samples for Neelix, a Borg drone, a Cardassian, and other fun aliens; assorted items from Deep Space Nine, such as a Bajoran harp, the Orb of Wisdom, and the garish clothes of a Ferengi Grand Nagus, complete with a necklace stringing together a series of golden earlobes. And happy day, there were some model ships (hooray! ), including a Cardassian ship, a space station, a shuttlecraft, and a damaged Oberth-class ship that was detailed to the point where you could see the individual decks through the holes in the ship. Excellent. To my great delight, I got to see a Nebula-class starship (my favorite type of starship), except it was hanging from the ceiling so that I could only see part of it from far away, and the thick strings that were holding it in place kinda took away from the whole "flying through the air" illusion. Lastly, there was a nice chunk of wall dedicated to the latest Star Trek movie, the franchise reboot, that had basically all of the major characters' costumes and all of the major props, my favorite of which was the tricorder that had the word "Tricorder" written on it, as though it were a cell phone bearing the Nokia or Samsung label. 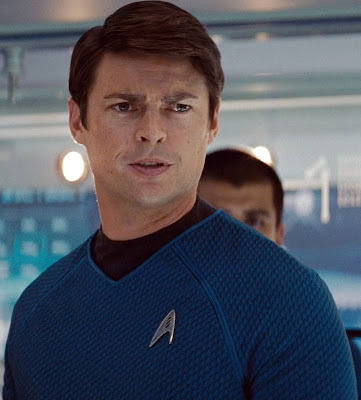 It was also a nifty surprise to find out that the Starfleet uniforms in the movie didn't consist of one solid color; the uniforms had a repeating pattern of the Starfleet delta emblem which you can only make out at close range. Very cool. And let's not forget about the gift shop, which was selling t-shirts and mugs and DVDs and toys for a slightly elevated price, most of which I've seen in regular stores (except the t-shirts and mugs, which they probably only sell in irregular stores). There you could also stand in line to see whether or not the photos the professionals took of you sitting in Kirk's chair were worth keeping, and if they weren't, you had to pay full price to get back into the exhibit to try again. Star Trek: The Exhibition was more than I could ever hope for, and, at the same time, a little bit of a letdown. On the one hand, I rode in a fun simulator ride, I saw just about all of my favorite props, I examined a bunch of great models, I saw the saucer section of the Enterprise-D up close and have pictures to prove it, I gained a deeper appreciation for the costumes, I sat in Kirk's chair, and I walked the bridge of the Enterprise and sat in the captain's chair, which was worth the price of admission on its own. On the other hand, a large number of the items on display were replicas, there were almost no objects on display from Voyager or Enterprise, the sets weren't as interactive as they could have been, none of my absolute favorite ship models were on display (which was shocking, considering how many favorites I have), and the presentation of a few items was hardly ideal (such as Kirk's chair sitting in the corner or the Nebula-class ship hanging so high up in the air). Overall, there was nothing truly bad about the exhibit; the problem is that the pictures on the official Star Trek: The Exhibition website offer a tantalizing glimpse of things that were on display that I was hoping to see, but didn't. However, even if everything pictured on the official website had been at the Franklin Institute, I'd still be clamoring for more; 40+ years of Star Trek history is a lot of ground to cover, and it's not unreasonable to want to see it all. Bottom line: Star Trek: The Exhibition was a wholly worthwhile experience, and even though it could have been an even more geek-tastic experience, I greatly enjoyed myself and got to see and experience many things I may never have a shot at again--especially the bridge of the Enterprise, replica or not. Just before leaving the exhibit, I made one final sweep to ensure I hadn't missed anything. When I returned to the first room, a photographer was standing near Kirk's chair. So I got a picture. And I'm a total goofball. Glad you got to live the dream man! Sounds like a lot of fun. LOVE THE PICTURE!